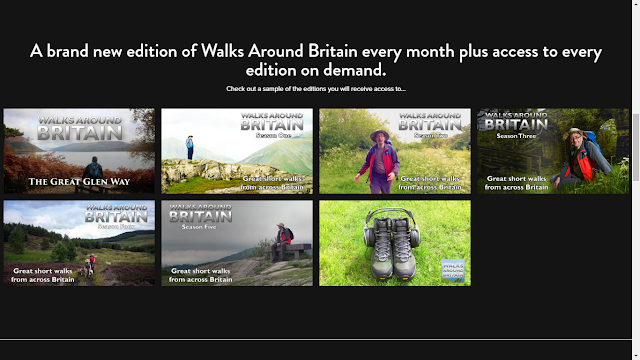 The successful syndicated TV series Walks Around Britain has today launched it own web-based subscription video on demand (SVoD) platform. Dubbed the “Netflix for walking”, it is the first SVoD platform to be dedicated to walking and the great outdoors and is available worldwide. The site soft launched in December 2018, but launches fully today at https://walksaroundbritain.vhx.tv. Previously, the small team behind the Walks Around Britain TV series had made seasons of seven programmes which have then been broadcast various local and national television channels, but with the new SVoD site, the programme will move to year-round production, producing at least one new edition of Walks Around Britain a month which will be available on the SVoD site first. A new window of exclusivity – rather like with Hollywood films – will see the programmes be eventually also available on Amazon’s Prime Video and then later on broadcast television. Walking is the most popular outdoor leisure activity in Britain, and the Walks Around Britain brand has been at the forefront of of the industry for 10 years – first launching as a website in August 2009. The brand’s combination of focusing on short walks (between 2-8 miles) and featuring real and relatable presenters, have ensured it is one of the most trusted and popular names in the outdoor world. We’re thrilled to be able to offer this new way of our audience to connect with us and engage directly with the team making Walks Around Britain. All of the previous five seasons of our TV series is available instantly and on demand in HD, and we’ll be making new editions every month – so our subscribers will always have something new to watch. In addition to the main TV series, we’re working on a range of exclusive interviews and other videos too for our subscribers, and they’ll also get the monthly Walks Around Britain podcast before it’s available on iTunes and Google Podcasts too. There are few other independent producers in the world who have the same relationship with their audience as we do for Walks Around Britain, and we’ve already seen an impressive take up of subscribers. It’s important to us that we still have a presence on free-to-television – that’s how many people find us – but we’re dedicated to adding new and time exclusive content to our SVoD site especially for our subscribers. Ensuring robustness in the website and the back-end systems has been a key feature of developing the platform, which is why Nova went to the trusted team at VHX – now part of Vimeo. However, this means at the moment, the pricing of the Walks Around Britain SVoD site is in US dollars. “At present the Walks Around Britain SVoD offer is priced in US dollars, and we are aware this is an issue, as clearly lots of our audience is in the UK and Europe. Our platform partner is working on delivering local pricing this year, so we’ll be able to offer our prices in UK pounds soon. We do also have a large audience in the US, and our new SVoD site offers them a great way of getting our uniquely British content. Subscribers can pay monthly at $5.99 or annually at $36.00 – with a free seven day trial available before subscriptions start. Currently, there’s a promo code “FOUNDER” offering 50% off the monthly price for 12 months. The Walks Around Britain brand encompasses the website, podcast, various social media accounts - including Britain’s most followed dedicated short walks Twitter account with 35,600 followers – and the popular television series – which has been shown on a channel in the UK everyday since the 1st January 2017. In a separate development, Sky channel myTV has started to show Walks Around Britain in the mid afternoon, joining 19 broadcasters in the UK in showing the series.